Orka Park Elite Apartments in Ovacik for Sale is a development consisting of 20 duplex 2 bedroom apartments. Located in the beautiful valley of Ovacık with spectacular views of the Babadağ mountain, Ovacik valley valley and surrounded by pine forests. The location of these apartments is perfect with just a few minutes walk to the main Ovacik road where you will find an abundance of shops, bars and restaurants. There is a choice of garden or penthouse apartments available and every apartment has a view of the swimming pool and gardens. There is a slo a large childrens pool. These apartments are perfect for either a residential purchase or for the holiday market where rental will be in high demand because of th location. The apartments share a large swimming pool and enclosed gardens. 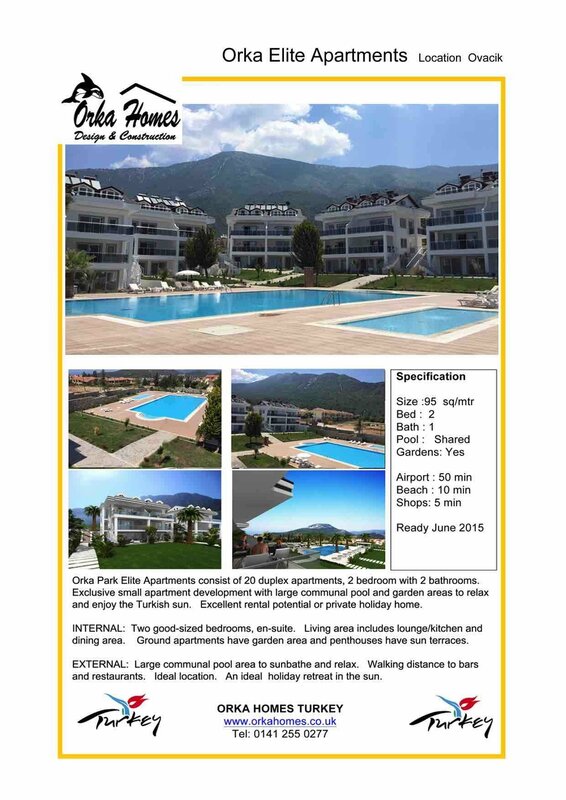 If you are looking for an apartment in Ovacik for sale then these are in the ideal location as they are just a short walk to all the local shops, bars and restaurants.